A couple weeks ago, we were in Whole Foods Tempe looking for some back-to-school snacks. 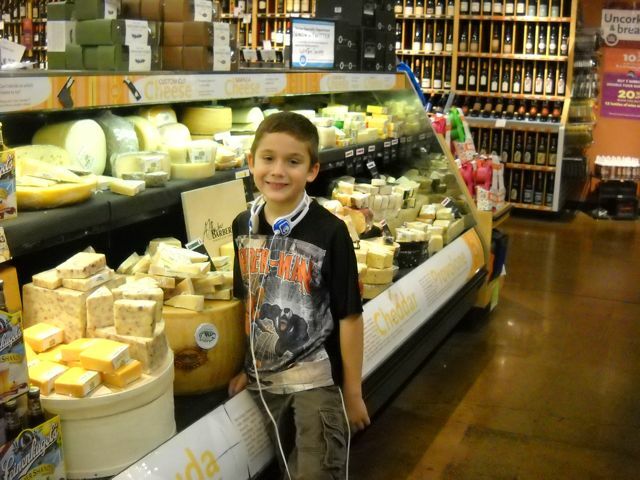 We were by the cheese display, and Nate was amazed at the size of some of the rounds of cheese. He didn't believe me at first when I told him that was how some cheese was made, and then pieces were cut from the large round. 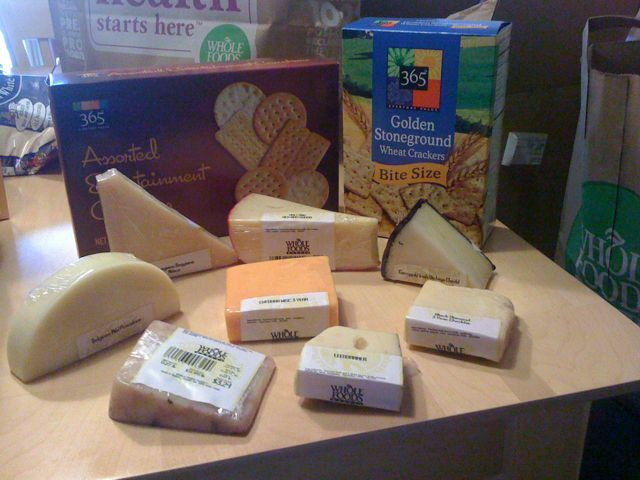 We talked a bit about cheese, and then I suggested we pick up a few varieties to try. He thought that was a neat idea, so we chose 8 different chunks of cheese and planned to have a cheese party. We also picked up a couple different varieties of crackers. It took a week or so, but one night everyone was home early enough that we were able to enjoy our cheese spread. We had some delicious green grapes, and Bo would slice one type of cheese and we'd all try it. Everyone was great about trying the different varieties -- even if some insisted on only eating Ritz crackers with their cheese. Not surprisingly, we all loved the Wisconsin aged cheddar. But, we also all liked Leerdammer (a semi-hard cheese with many holes like swiss, but not as strong) and I doubt I would have ever picked up a chunk of it if not for Nate's excitement. In fact. of the 8 we chose, none were deemed yucky! It was so much fun that I think we may make it a new tradition! Our cheese dinner occurred a couple nights before school started this year, so maybe we'll tie it to every new school year. On a completely silly note, here's an ad I found for Leerdammer cheese . . . it's so silly but it made me laugh! I LOVE this idea! I bet my kids would love to do this too. I'm glad it worked out so well, we are gonna have to try this!